ClickUp | Completely customizable project management software. Defining what’s important should be simple - and fun! Create custom-tailored workflows that your whole team can embrace to be more productive. It’s not often that tasks jump straight from “open” to “closed”. Add personalized workflows for your Spaces and Projects to keep track of task progress. Do what you want with Custom Fields. Make ClickUp completely customized! Custom fields let you use ClickUp for virtually anything you can imagine. Track, sort, and filter work according to your team’s needs. 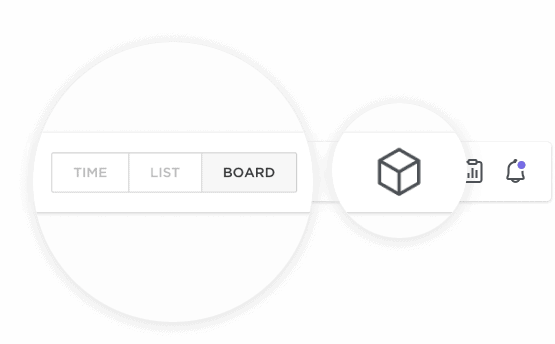 Instantly toggle between List, Board, Box, and Time Views to gain new insight into your task lineup. Check in to see who’s on track and who needs motivation with select sorting and filtering options. Save popular sorting and filtering views to your Favorites, and come back to them any time! Multiple Assignees, when you need them. Create templates from your favorite Spaces, Projects, Lists, tasks, and checklists for repeated use. Choose what to carry over from the template when you create something new! Make notifications work for you, when you want them to. Pick what you want to be notified about, how you want to be notified and when. You have more control than with any other tools. Save filters for your most popular searches, such as high priority and overdue. Access these saved filters at any time. You can save for Team or Me views, too. Why be boring? Choose your favorite color and make ClickUp your happy place. “Dark mode change my life.” If you work at night, you’ll freaking love dark mode. ClickUp just works--no training necessary. You can onboard and begin in a matter of minutes. Whether you need to quickly import from another software, or just familiarize your team with the platform, we make it easy. Tasks, reminders, calendars, to do lists, for you and your teams - all in one place.